There are many management advantages that come with better knowledge of how ecosystems will respond to human and environmental pressures. Incorporating understanding of non-linear ecosystem responses into policy and management decisions and clearly stating assumptions about these relationships can reduce the risk of adverse social, economic, and ecological outcomes and surprises associated with ecosystem shifts. Here you’ll find resources and guidance to help you integrate tipping points science and concepts into your decision-making to help improve the outcomes of your own ecosystem-based management. Why should we care about tipping points in ecosystem-based management? Many ecosystem-based managers already intuitively understand tipping points as they have witnessed climate-driven shifts in marine food webs1, cascading effects of eutrophication and anoxia2,3, or collapses of marine resource-based economies in their own management areas4. Even with this first-hand understanding, rapid ecological shifts may surprise us, especially when we so often assume a gradual, linear ecosystem response to human and environmental drivers. Dramatic changes in marine ecosystems not only impact the ecological system itself, but can also have reverberating impacts on social, cultural, and economic systems that depend upon them5,6,7. In light of our increased understanding of the prevalence of non-linear responses in marine ecosystems, we as a science and management community can benefit from new or renewed consideration of how management plans and strategies can account for potential tipping points, to either head them off before they occur, or recover from them once they have been passed. There is a growing policy demand for ecosystem-based management (EBM) approaches that account for the full array of interactions within an ecosystem, including humans. New methodologies to address cumulative impacts, account for tradeoffs and interactions among sectors, and increase ecosystem resilience are increasingly needed. From the Magnuson-Stevens Act (MSA) and the Sanctuaries Act, to the National Environmental Protection Act (NEPA) and the U.S. Ocean Policy, many of our most influential policy mandates are advising us to address cumulative impacts and incorporate more holistic management options. 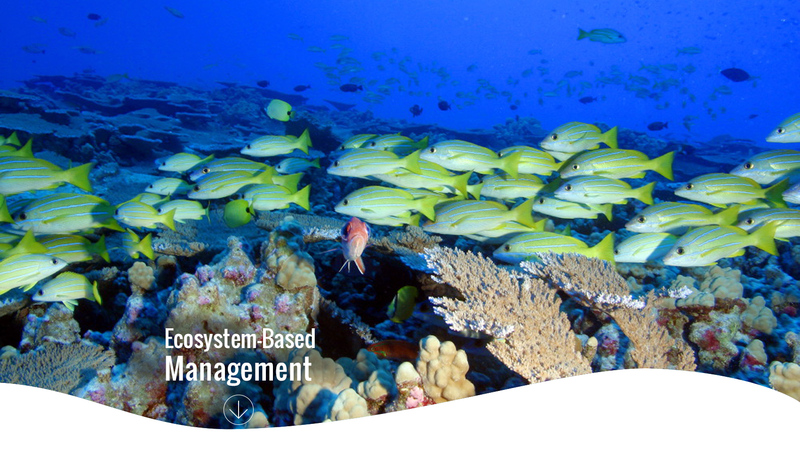 To meet this demand, new approaches are being developed and piloted for ecosystem-based fisheries management (EBFM), quantification of cumulative impacts, and ocean planning to deal with increasing pressures and emerging uses. Including a tipping points perspective in your ecosystem-based management work can enhance your management outcomes by linking your decision-making to quantitative system reference points and targets. Tipping points thinking is highly relevant to ecosystem-based management as it encourages scientific and management focus on ecosystem-level responses and is specifically aimed at detecting large, ecosystem-level changes and avoiding surprises8. It also highlights the importance of quantifying cumulative impacts as well as the linkages and feedbacks within social-ecological systems by focusing on potential thresholds within these systems. Applying a tipping points perspective can help you to identify ecosystem indicators, reference points and targets for these indicators, insights into key drivers of change within your system, and contribute to an overall better understanding of social-ecological linkages and potential threshold responses to change. Explore the environmental and cumulative impact analysis processes under National Environmental Policy Act (NEPA), identifying ocean tipping point science “integration points” along the way. Gain deeper understanding of how tipping points science can integrate into fisheries management under the Magnuson-Stevens Act and into water quality decision-making under the Clean Water Act. If you are looking to dive deeper into detailed analysis tools that may help improve your ecosystem-based management, visit our scientific analysis tools page. For more information on how to apply tipping points science to adaptive management decision-making visit our Ocean Tipping Points Guide. Throughout the Caribbean, many coral reef ecosystems have crossed a tipping point and transitioned to algae dominated reefs. Our research from Caribbean reefs demonstrates that focusing on indicators that provide early warning of degradation and prioritizing ecosystem-level reference points can keep coral reefs within a sustainable safe operating space9. Ocean Tipping Points researchers have explored coral reef transitions across the region and are beginning to understand the warning signs for transition from a coral dominated state to an algal dominated state. The findings show that maintaining adequate reef fish biomass could be a key to managing for resilient coral reef ecosystems. By monitoring fish density, we can understand the health of the ecosystem and future management scenarios. For example, when the density of fish in a system is similar to the density of fish when no fishing occurs in the system (‘Unfished density’) a healthy coral-dominated reef is more easily maintained. With fishing, a number of metrics including the proportion of fish that feed on invertebrates, the number of fish species, and urchin density, change as fish densities fall below 50-60% of unfished densities. At this point, close monitoring of the system to track potential changes is recommended. When fish densities reach 30% of unfished densities, a suite of changes occur: the ratio of macroalgae to coral increases, the proportion of herbivorous fish in the fish community decreases, and coral cover drops markedly. The fact that the reef is in a different state becomes obvious. You can read more about this research in the EDFish Blog and in our scientific paper, Karr et al. 2015. Across the west coast of North America, identifying ecosystem-level thresholds and how they relate to otter density has been a key to successfully managing nearshore reefs. Throughout the region, many temperate reef ecosystems have transitioned from kelp dominated to urchin dominated systems following the extirpation of sea otter populations. In many of these areas, field studies have been successful in estimating the predator and urchin density thresholds that cause the system to tip into a new state. By using these thresholds to inform management in California, Alaska, and British Columbia, among other Pacific regions, managers have been able to maintain ecosystems in their socially preferred state. The infographic below uses the kelp forest-urchin barren example to illustrate seven principles, developed by our team, to help marine managers strategically predict and prevent tipping points. Integrating these principles into current management practice can be a cost-effective, efficient, and practical approach for managing ecosystems prone to tipping points. Having principles in place can motivate and guide acquisition of appropriate data, indicators, and monitoring plans. You can read more about these principles on our Blog and in our scientific paper, Selkoe et al. 2015. In Haida Gwaii, British Columbia the Ocean Tipping Points team has been working with local managers to understand the non-linear dynamics at play in the coupled human-natural system centered on Pacific Herring. Here we are not only looking at the herring biomass necessary to maintain the local herring populations, but are also taking a “one-third for the birds” approach to setting management targets and considering the herring biomass levels necessary to support other species that depend upon herring in the Haida Gwaii nearshore system like humpback whales and seabirds. We are also looking at how changes in the spatial distribution of herring spawn sites over the last 50 years have not only led to tipping points in the herring population, but also in the social and cultural practices of members of the Haida First Nation. Read more about our ecosystem-based tipping points science work in Haida Gwaii. Kruger National Park, South Africa, increased the social and ecological success of their EBM outcomes by establishing “Thresholds of Potential Concern” that define a social-ecological safe operating space and are used to monitor and adaptively manage the Park10. The Park was created in the early 1900s to protect dwindling wildlife populations. Park managers have been successful in boosting wildlife populations, particularly elephants. However, early observations indicated that booming elephant populations and fire were significantly impacting the vegetated habitat upon which the rest of the local ecosystem depended. When elephant populations are below a certain threshold, vegetation is diverse and supports many animal species. Above that threshold, elephants disturb large areas of habitat with negative impacts on other species. To avoid vegetation and biodiversity loss, elephant culling began in the late 1960s. However public outcry and international political pressure led to the end of the cull in 1995 and influenced how the Park considered social preferences within future management decision-making. The tipping point between elephant density and vegetation loss is one among many tipping points that Kruger Park monitors, including ecological thresholds in river water quality, fire, invasive species, and endangered species. In 1997, Kruger National Park managers developed a set of operational goals called “Thresholds of Potential Concern” or “TPCs.” TPCs are thresholds in specific environmental indicators that help managers identify when the environment is outside of a desirable state. The usefulness of TPCs comes from the creation of a hierarchy of social and ecological objectives that guide management decisions, allowing for species and ecosystem issues and human interests to be discussed and managed under a set of unifying goals. The adaptive management framework in Kruger National Park clearly values and defines different ecosystem benefits, allowing managers to better understand whether going over a particular threshold is desirable. Moreover, the system ensures consistent monitoring of key ecological indicators—representative of broader ecosystem shifts—and identifies thresholds of concern on geographic scales relevant to the projected tipping point as well as management action. Oguz, T., and D. Gilbert. 2007. Abrupt transitions of the top-down controlled Black Sea pelagic ecosystem during 1960–2000: evidence for regime-shifts under strong fishery exploitation and nutrient enrichment modulated by climate-induced variations. Deep Sea Research Part I: Oceanographic Research Papers 54:220–242. Greening, H., and A. Janicki. 2006. Toward reversal of eutrophic conditions in a subtropical estuary: water quality and seagrass response to nitrogen loading reductions in Tampa Bay, Florida, USA. Environmental Management 38:163–178. Hamilton, L.C., Butler, M.J. Outport adaptations: Social indicators through Newfoundland's Cod crisis. (2001) Human Ecology Review, 8 (2), pp. 1-11. Biggs, R., M. et al. 2012. Toward Principles for Enhancing the Resilience of Ecosystem Services. Annual Review of Environment and Resources 37:421-448. Graham, N. A. J., D. R. Bellwood, J. E. Cinner, T. P. Hughes, A. V. Norstrom, and M. Nystrom. 2013. Managing resilience to reverse phase shifts in coral reefs. Frontiers in Ecology and the Environment 11:541-548. Lebel L , Anderier JM ,Campbell B , et al. 2006.Governance and the capacity to manage resilience in regional social–ecological systems.Ecol Soc 11: 19. Selkoe, K.A., Thorsten B., M.R. Caldwell, L. B. Crowder, A. L. Erickson, T. E. Essington, J. A. Estes, R. M. Fujita, B. S. Halpern, M. E. Hunsicker, C. V. Kappel, R. P. Kelly, J. N. Kittinger, P. S. Levin, J. M. Lynham, M. E. Mach, R. G. Martone, L. A. Mease, A.K. Salomon, J. F. Samhouri, C. Scarborough, A. C. Stier, C. White, and J. Zedler. 2015. Principles for managing marine ecosystems prone to tipping points. Ecosystem Health and Sustainability 1:17. Karr, K., R. Fujita, B. S. Halpern, C. V. Kappel, L. B. Crowder, K. A. Selkoe, P. M. Alcolado, and D. Rader. 2015. Thresholds in Caribbean coral reefs: implications for ecosystem-based fishery management. Journal of Applied Ecology 52(2):402–412. Gillson, L, and K.I. Duffin. 2007. Thresholds of potential concern as benchmarks in the management of African savannahs. Phil Trans of the Royal Society 362(1278): 309-319.